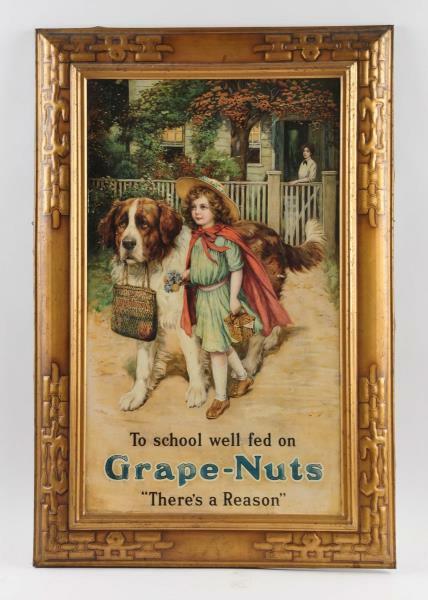 This is a classic self-framed tin sign from the Grape Nuts cereal brand, featuring a young girl and her Saint Bernard dog holding her school bag in its mouth. The slogan says “To School Well Fed on Grape Nuts, There’s a Reason”. 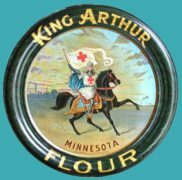 This particular sign is commonly seen in many early 1900’s General Store photographs. 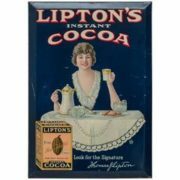 Apparently the sign was distributed widely as you can find them fairly easily even today.